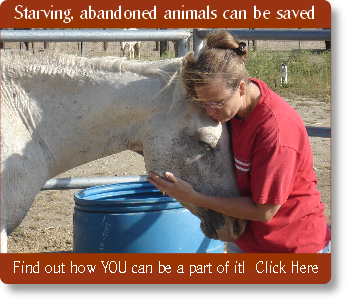 It is our mission to help meet the need for a "safe haven" for horses who are at risk, neglected, abused, unwanted or otherwise in need of special care. This "safe haven" is extended to (but not limited to) horses and other farm animals such as goats, pigs, chickens, llamas, etc. This "safe haven" will provide a place where these animals will undergo an evaluation process to determine each animal's rehabilitation and placement needs. Where possible, safe, caring homes will be found for rehabilitated animals. Others will find Heavenly Horse Haven to be their permanent home and live out their natural lives with us. Our objective is to raise community awareness of the plight of these animals and to provide instruction to the general public on the proper care, feeding, needs and responsibility of ownership for these animals in the hope of someday eliminating the need for such a "safe haven". With our current economy and fuel costs, the price of hay and farm animal feed has nearly doubled in the past year. This has created an epidemic of starving horses and farm animals. We need your help to save as many of these animals as possible. Your donation will help us save a life and create a bright new future for these animals.